Greater Love of God - My Catholic Life! 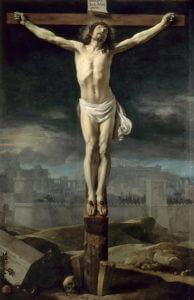 My crucified Love, my dear Jesus! I believe in Thee, and confess Thee to be the true Son of God and my Savior. I adore Thee from the abyss of my own nothingness, and I thank Thee for the death Thou didst suffer for me, that I might obtain the life of divine grace. My beloved Redeemer, to Thee I owe all my salvation. Through Thee I have hitherto escaped hell; through Thee have I received the pardon of my sins. But I am so ungrateful, that, instead of loving Thee, I have repeated my offenses against Thee. I deserve to be condemned, so as not to be able to love Thee any more: but no, my Jesus, punish me in any other way, but not in this. If I have not loved Thee in times past, I love Thee now; and I desire nothing but to love Thee with all my heart. But without Thy help I can do nothing. Since Thou dost command me to love Thee, give me also the strength to fulfill this Thy sweet and loving precept. Thou hast promised to grant all that we ask of Thee: You shall ask whatever you will and it shall be done unto you. Confiding, then, in this promise, my dear Jesus, I ask, first of all, pardon of all my sins; and I repent, above all things, because I have offended Thee, O Infinite Goodness! I ask for holy perseverance in Thy grace till my death. But, above all, I ask for the gift of Thy holy love. Ah, my Jesus, my Hope, my Love, my All, inflame me with that love which Thou didst come on earth to enkindle! “Tui amoris me ignem accende.” For this end, make me always live in conformity with Thy holy will. Enlighten me, that I may understand more and more how worthy Thou art of our love, and that I may know the immense love Thou hast borne me, especially in giving Thy life for me. Grant, then, that I may love Thee with all my heart, and may love Thee always, and never cease to beg of Thee the grace to love Thee in this life; that, living always and dying in Thy love, I may come one day to love Thee with all my strength in heaven, never to leave off loving Thee for all eternity. O Mother of beautiful love, my advocate and refuge, Mary, who art of all creatures the most beautiful, the most loving, and the most beloved of God, and whose only desire it is to see him loved! ah, by the love thou bearest to Jesus Christ, pray for me, and obtain for me the grace to love him always, and with all my heart! This I ask and hope for from thee.